House Republicans will be down one woman next year. And with administration picks forthcoming and a handful of female members weighing runs for other offices, the party’s gender gap could grow. With their largest majority in more than 80 years, Republicans were mostly on defense in 2016. It was a “hold year,” said Jennifer Higgins, the chairwoman of congressional outreach for RightNow Women PAC, which supports female Republican candidates. Republicans are losing Michigan Rep. Candice S. Miller, the only woman to chair a committee, and Wyoming Rep. Cynthia Lummis, the only woman in the House Freedom Caucus, both of whom are retiring at the end of the 114th Congress. North Carolina Rep. Renee Ellmers lost her primary in April. Without many opportunities to recruit challengers, open seats became more important. Indeed, the two female recruits who won this year were in seats without an incumbent. The House Republican Conference is gaining New York Rep.-elect Claudia Tenney and Wyoming Rep.-elect Liz Cheney for a total of 21 GOP women in the 115th Congress. Eyes are on North Carolina Rep. Virginia Foxx to take the gavel of the Education and the Workforce Committee, mitigating the loss of Miller as the only committee chairwoman. Going forward, though, the party is at risk of losing more women. Tennessee Rep. Marsha Blackburn is on President-elect Donald Trump’s transition team and could be selected for a position in the administration. Trump met with Conference Chairwoman Cathy McMorris Rodgers on Nov. 20. If Alabama Sen. Jeff Sessions is confirmed for attorney general, Rep. Martha Roby could run in a special election for his Senate seat. Looking ahead to 2018, at least one woman will be leaving the conference. South Dakota Rep. Kristi Noem is running for governor. One woman may be in the mix to replace her. Tennessee Rep. Diane Black is thought to be interested in her state’s governorship, as is Kansas Rep. Lynn Jenkins, who decided not to seek a third term as conference vice chairwoman. Missouri Rep. Ann Wagner is a top pick to take on Democratic Sen. Claire McCaskill, while Rep. Vicky Hartzler may be interested, too. In Indiana, Reps Susan W. Brooks and Jackie Walorski could challenge Democratic Sen. Joe Donnelly. Virginia Rep. Barbara Comstock could be a strong pick to take on erstwhile Democratic vice presidential nominee Sen. Tim Kaine. Losing any or all of those women in the House means Republicans will need to recruit female candidates in open seats to break even with their levels in the 115th Congress. 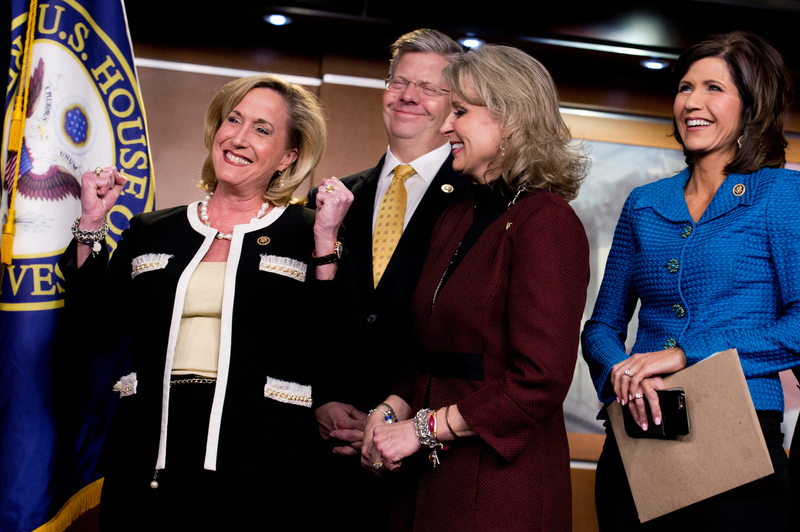 The GOP already has about two-thirds fewer women than House Democrats. That looming potential shortage will likely spotlight an occasional tension in open primaries between leadership supporting diverse candidates — a stated goal of the party — and backing candidates who check an ideological box. The National Republican Congressional Committee doesn’t play in primaries, although it may get involved in incumbents’ primaries under incoming Chairman Steve Stivers. Individual members do play in open primaries though. Look no further than Florida’s 2nd District primary earlier this year. In Mary Thomas, Republicans had the rare chance to increase diversity by electing an Indian-American woman. But Thomas had the backing of the House Freedom Fund — the campaign arm of the Freedom Caucus — and caucus Chairman Jim Jordan campaigned for her in the district. House Majority Leader Kevin McCarthy and other more establishment members backed her primary opponent, Rep.-elect Neal Dunn. “When you’re the majority leader and you need someone to vote for your agenda … you have to play your cards politically right,” said a female GOP operative. Conservatives bemoaned leadership’s prioritization of ideology. “They don’t truly care about making the party more diverse,” Senate Conservatives Fund president Ken Cuccinelli said in an email. His organization backed Thomas. “The tension that exists in backing Republican candidates has nothing to do with gender or ethnic background. It has everything to do with their ideology,” he said. Both factions of the party can make the diversity argument where it suits their ideological interest. In Arizona’s 5th District, for example, the Freedom Fund and the Club for Growth supported Rep.-elect Andy Biggs, while more establishment forces preferred female candidate Christine Jones. Last cycle, Project GROW helped members funnel money to female candidates. Led by Black and Wagner, the effort helped identify Reps. Elise Stefanik and Mimi Walters as top candidates in the beginning of the 2014 cycle. But plenty of other women didn’t survive their primaries in 2014. “You had members going out on a limb supporting other women and [they] weren’t making it through,” said a female GOP operative. In Minnesota this year, moderate businesswoman Darlene Miller received plenty of checks from establishment members, including retiring Rep. John Kline, whom she was seeking to replace. Miller was backed by Maggie’s List, a political action committee which helps elect conservative women to federal office, but even before the August primary, the group saw that their candidate wasn&apos;t going to win. Former radio talk show host Jason Lewis may not have had leadership’s support, but he emerged as a stronger candidate, winning the primary and the general election. Female GOP operatives agree that the focus in primaries should be on fielding the strongest candidates. If this year’s presidential election showed anything, Republican women say, it’s that women won’t vote for a woman just because she’s a woman. “People vote for values over gender. End of story,” said Missy Shorey, the executive director of Maggie’s List. If ideology is the salient factor in primaries, Republicans say they need more women to run in order to cover the philosophical spectrum. But first, conservative women need to step forward. “It takes someone with that personality like [Virginia Rep. Barbara] Comstock or Stefanik, who has that inner monologue saying, ‘I’m here for a reason other than typical female duties,’” said one female GOP operative. The proliferation over the last few cycles of GOP groups dedicated to female recruitment is a positive sign, said Higgins of RightNow Women PAC. Republicans have to catch up to the centralized infrastructure Democrats have built with EMILY’s List to vet viable female candidates. Female operatives, from both sides, agree that women often need an extra push to become candidates. “Take a look around your community. Who is that woman who should be running?” Shorey asked. Correction | An earlier version of this story misstated the current House Republican female makeup in relation to their Democratic counterparts. 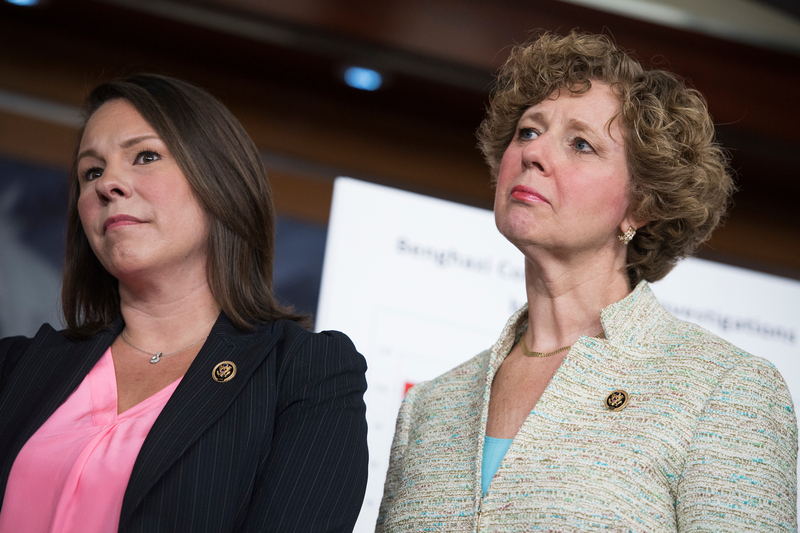 The GOP has about two-thirds fewer women than House Democrats, not a third fewer.